!! Gwen Stefani outfits your baby !! Gwen Stefani will soon be selling baby shoes as part of her L.A.M.B. fashion line. 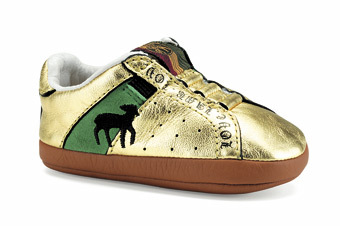 God bless the baby that wears shiny gold shoes in infancy. He is destined to be either a star or gay. « PREVIOUS ENTRY: Don’t Date Him, Girl! Be the first to comment on "Gwen Stefani outfits your baby"